I recently received a product for review. 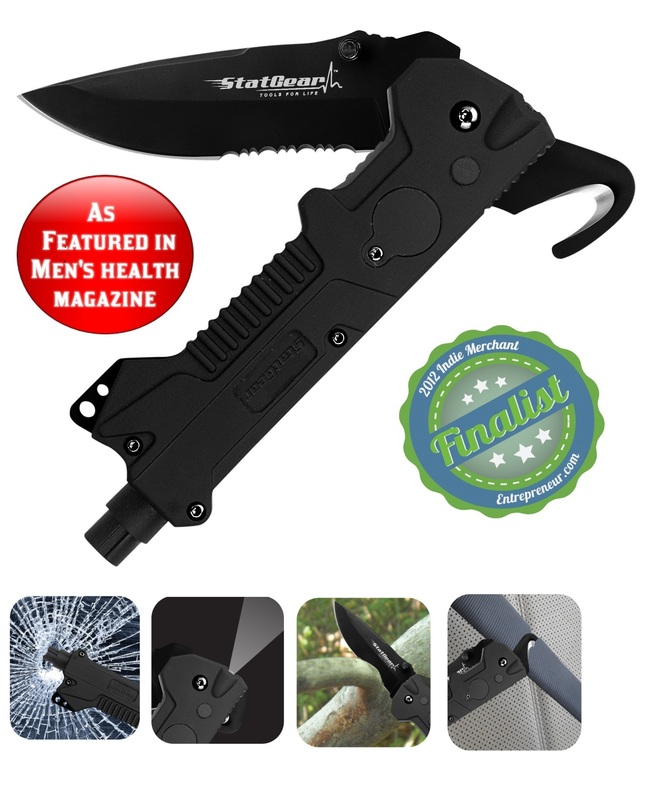 It is the T3 Tactical Auto Rescue Tool. This was also featured in Men's Health Magazine! I am supposed to get a man's perspective on this. So when we received it I asked my husband what he thinks of it. To paraphrase: he likes the stainless steel blade part. It is very sharp and can be used for anything. Besides car safety he probably will use it as a tool for other things. Such as camping, etc. He also thinks it is very well made and nice craftsmanship. He likes the LED light too and thinks that will come in handy. Also not sure if recommended to try, but he tested the spring loaded steel tipped window punch. He tried it on a glass bottle, and said it shattered the bottle in seconds. So this thing really works! I have my own personal reasons for wanting this too. Several months ago, in my town a car fell into a swampy area on the side of the road. The car went down into the water, and the driver was not able to get out in time. I drive by this particular spot a couple of times a week, and always think of this tragedy What if he had had the T3 Tactical Auto Rescue tool? Maybe he would have survived. I feel better knowing that I have this tool, in case something like that ever happens to me. If you would like to purchase one for yourself please visit: StatGearTools. This retails for only $39.99. Disclosure: I received the above product for the sole purpose of reviewing it. All opinions are my own. How annoying that they asked you to get a man's perspective! In our home I'm that one that buys and uses the tools. It does look like something that would be useful in the car though. It's always good to have tools in the car. I don't currently have any tools but I do have my Swiss Army Knife which I carry in my purse and jumper cables. I'll have to look into that. Looks like something that would be really handy to have with you in the car!! OH wow, that's so scary with the car in the swamp. I can see why you were interested in having one. Sounds like it's going to be handy in lots of ways (but hopefully not in that one). I'd have to find a place for it in my car so that I would be able to find it quickly if I needed it. I have been thinking the same thing Slehan!